NEW YORK (Scrap Register): United States silver scrap prices advanced on the Scrap Register Price Index as on Monday, tracking the up trend in silver futures prices at New York Mercantile Exchange. Trader and investor focus is turning to this week’s FOMC meeting of the Federal Reserve, which begins Tuesday morning and ends Wednesday afternoon with a statement. The FOMC is not expected to change its monetary policy at this meeting. The Fed has become more dovish the past few months. 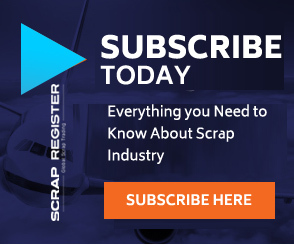 The major silver scrap commodities on the Scrap Register Price Index showed an uptrend on Monday. The hallmarked silver scrap prices gained by 0.17 percent to $12.662 an ounce and non-hallmarked silver scrap prices dropped to $11.239 an ounce. The most active May Silver contract on the COMEX division of the New York Mercantile Exchange has gained by 0.61 percent to $15.322 an ounce on Monday. The Brexit matter continues to play out but it’s on the back burner of the world marketplace. The U.K. has no “soft Brexit” deal in place ahead of the March 29 “hard exit” (no deal) for the U.K. to leave the European Union. Look for Prime Minister Theresa May to soon propose another plan for a soft Brexit to the Parliament.